He is so famous for taking the perfect free kick that he has had a film and a musical made about his talent. 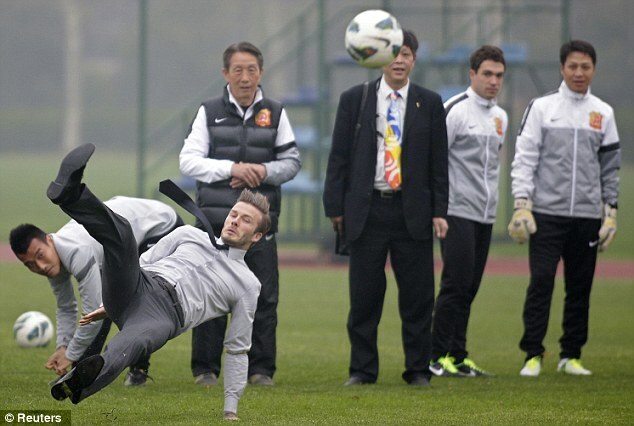 However, David Beckham was left feeling rather embarrassed as he slipped over and landed on his Beck-side while demonstrating his sublime technique. 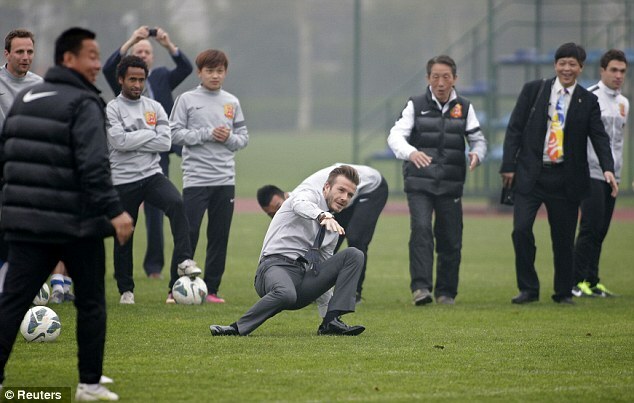 The 37-year-old dropped to the ground in front of a group of young Chinese footballers as he continued his Far East tour as part of his his five-day ambassadorial visit to China. 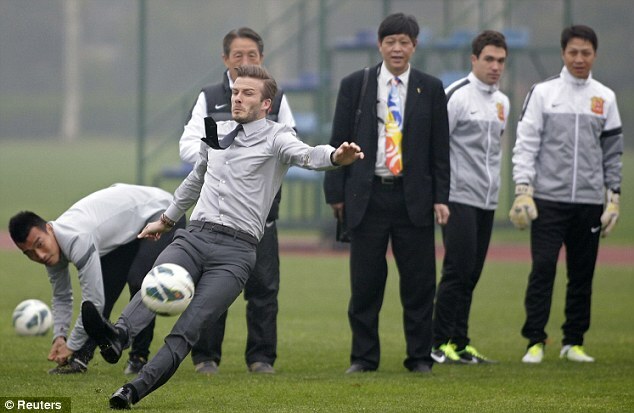 Looking as dapper as ever the superstar was dressed in a luxury grey suit and black shoes as he lined up to swing in a free-kick in front of starstruck players from Wuhan Zall club in the Hubei province. But it all went horribly wrong when he lost his balance and ended up flat on his back - although Beckham appeared to take the fall in good spirits. As Becks ran up to curve a ball into the top corner of the goal he took a terrible fall and slipped up into the air before crashing into the ground. Perhaps the Paris St Germain midfielder should have worn a pair of his customised adidas football boots, rather than his smart shoes. 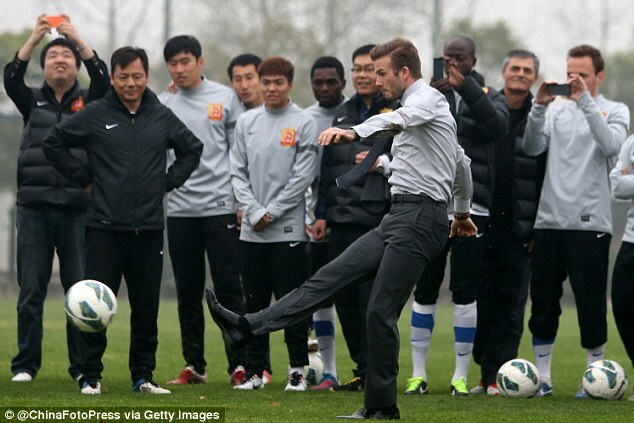 Meanwhile, the former England captain has vowed to promote football in China over a long period of time, and make it one of the most popular leagues in the world. 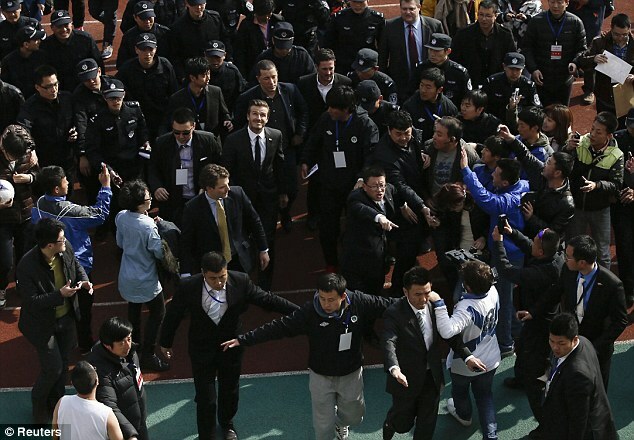 'Thank you for having me in your wonderful city', wrote Beckham on Friday after being mobbed upon his arrival in Qingdao. Beckham, who has played four games for new side Paris Saint-Germain and completed his first 90 minutes last week before the international break, said: 'I want people to realise this is not a short-term project. 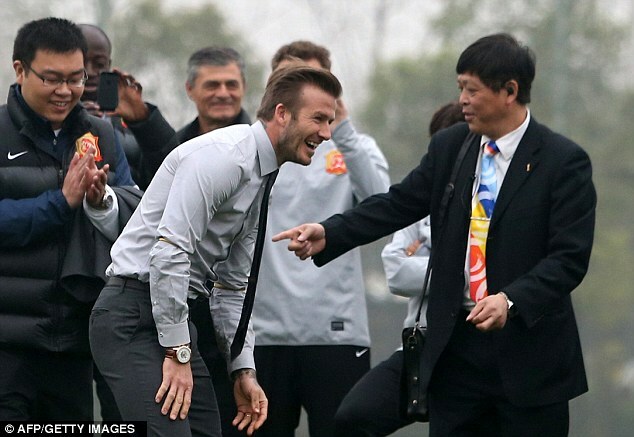 Beckham continued: 'I've always been a fan of Chinese football because I think the players are very talented and they are very passionate.